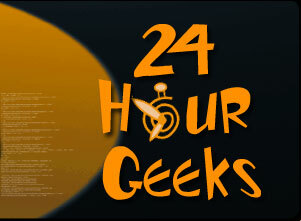 24 Hour Geeks provides onsite and online computer and network assistance for both home and business clients 24 / 7 in the Greater Toronto Area. Remote Assistance is availalbe for clients not in the GTA. We support Microsoft operating systems for stand-alone and networked computers and servers, and many current Windows software applications. Install and configure Wireless Routers and networked equipment. Need help with Tablets,IPads or Smartphones we do that too!!! Subscribe free of charge to the 24 Hour Geeks Newsletter which provides important information including Virus Alerts, Service Pack and Software Patch announcements. We provide timely repairs onsite or using remote assistance at affordable rates without the hassle of hauling your machine to a repair shop, and at a time convenient to you. All technicians are certified by Microsoft and Comptia, and all work is fully guaranteed. Serving the Greater Toronto Area since 2001 !